Leikkaan kortit : We can all shine! Hei, hauskaa perjantaita Artin kevyiden leidien kera! Kortit tilaustyötä neljälle siskokselle! 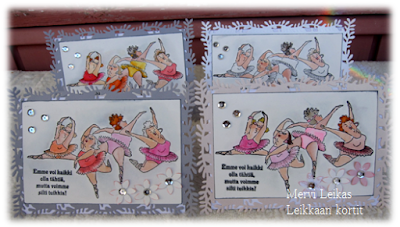 Hi, happy Friday with these four cards saying " We can't all be stars, but we can all shine!" 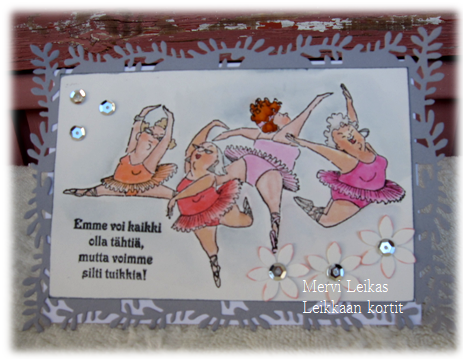 Frame Spellbinders, Fiskars flower punch, sequins. 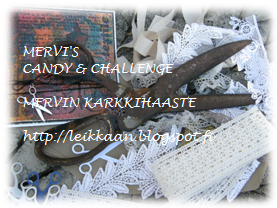 Remember to join in my Candy & Challenge! Theme is birthdays with numbers! Hi, Mervi! PURE DELIGHT! Your ballerinas are the best! LOL wish I could still do that! Really great colors, and a darling image! Thank-you for joining us at the Cardz 4 Galz Challenge. We love seeing your paper crafting projects, and are so happy you have joined us! Please check back to see if you have won a badge! What a fun set of cards, great image and perfect sentiment to go along with it! such a fun card set!! Thank you for playing along with us at simon says stamp wednesday challenge! !